Modern comfort and style, the contemporary Essenza Stacking Chair is a fantastic addition for enhancing outdoor dining areas, patio seating and resort accommodations. Because of its innovative polymer resin construction, the Essenza is able to stay cool under the sun while withstanding high volume use and tough weather conditions. 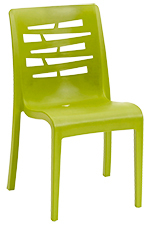 This versatile and low maintenance chair conveniently stacks when not in use and simply wipes clean with soap and water. Elevate the fun and guest enjoyment with the accessible and trendy Essenza Stacking Chair.